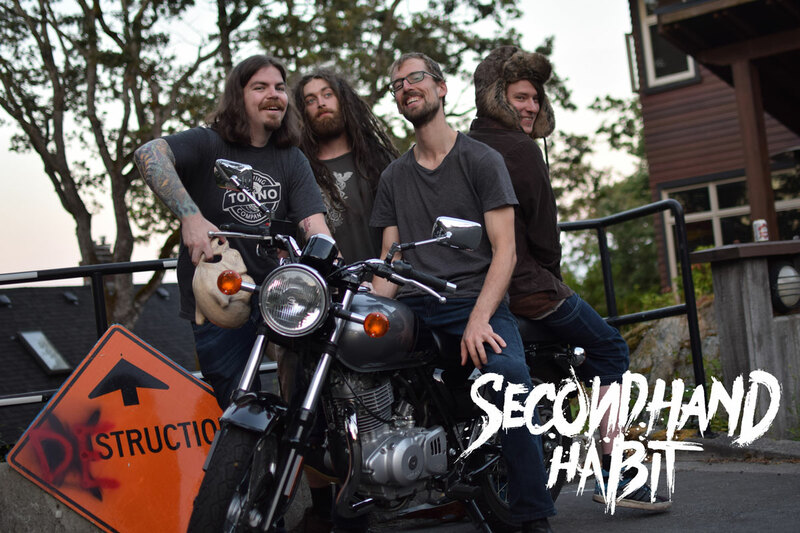 We’re Secondhand Habit a high voltage rock n roll band from Victoria, BC, Canada. We formed back in 2010 as some goofy jamming in a basement and have evolved drastically over the years. When we first started we were much more “poppy” with lots of comedic lyrics but as members came and went the sound slowly morphed into high energy hard rock. We like the music to feel like it is alive and pumping with energy. When you hear that type of song or genre it almost pulls you onto your feet to see what’s going on. We’re all musically very different but love lots of the same bands like Alice in Chains, Audioslave, Soundgarden, Nirvana, Guns N’ Roses, Priestess and tons more. So far we’ve released 4 EPs, 1 LP and 1 single totalling 31 songs, although they’re not all available online. Since we’ve changed several times only a few of them are available. We’ve also gone on 4 Canadian tours stretching as far as Toronto (4,400km from home), played in a few local festivals, and countless home shows in and around Victoria, BC. Locally we’ve been able to cultivate a small music scene amongst ourselves and lots of other talented local bands that has been expanding these last few years which is pretty cool to see. We like to play fast and hard, we get up on the stage and give it our all while trying to interact with the crowd between songs. As mentioned above we’ve played all over Canada with all sorts of bands like We Hunt Buffalo and Daniel Wesley, we’ve even got a gig with Electric 6 coming up in April! How ever people are taking in our music is alright by us. It’s cool with downloading and streaming because we have a way of seeing who downloaded our tracks with stats and fun things like that. But we’ve also had people come up to us and buy new CDs because they’ve worn through their old one, or that they always have it in their car and their passengers always dig it. Personally I like downloading and streaming because I listen to a lot of music while driving or on the computer, I also listen to SiriusXM in the car when I want some new tunes. There’s so much music out there but lately I’ve been digging the new albums from Thrice, Ice NineKills and Royal Tusk. We’re currently planning to record a few more singles in the next few months so stay tuned for those. We also hope to get into some festivals this summer and to continue expanding our reach through the world!